I received a query from a chef, who was preparing a themed dinner of American classic dishes. He was puzzled because he couldn’t find anything on the origins of chicken à la king. I’ve been wondering for a long time where all the chicken à la king went. A few years ago, I began to think that the government might have it stored somewhere — in huge silos, maybe, or in those salt caves in Kansas where they keep surplus rutabagas…. Where did the dish come from? In looking into the dish’s origins, I quickly discovered that the problem was the exact opposite of what the chef thought it was. Rather than a shortage of answers, there were entirely too many explanations of the dish’s early history. One version claims that Thomas Jefferson created the dish at Monticello. We can discard that one immediately: We could find no mention of anything resembling chicken à la king in Jefferson’s papers. Moreover, does it seem reasonable that the author of the Declaration of Independence would name something after a king? Not likely at all. In another version, French chef Charles Ranhofer, at New York’s Delmonico’s, invented the dish in the 1880s. Horse breeder Foxhall P. Keene — an alleged regular customer — was the first to sample the new creation, and consequently, it was originally named “Chicken à la Keene.” Not exactly “Chicken à la King,” but close enough to be believable, if you’re the sort who believes just about anything you’re told. Another version says that chef “Finnan Haddie” Joe Bolton of College Inn — a 1920s Chicago speakeasy and restaurant — invented the dish. According to College Inn’s corporate website, chef Joe Colton of College Inn (note the different spelling, and loss of nickname) invented the dish. We contacted Del Monte Foods, the current parent company of College Inn (known, today, primarily for its canned stocks and broths; we’ve always suspected — wrongly, it seems — that the company name was a pun on “collagen,” the substance from bones and connective tissue that gives body to stocks), to get more details. Their spokesperson described the original College Inn as a “nightclub,” and claimed it was “the oldest nightclub in America.” Beyond providing the company’s history of corporate ownership, the only thing the spokesperson added was that the College Inn company was formed in 1923. Based on that information, we began to suspect that the other story details — about Colton, for example — may not be entirely accurate. Those suspicions were aroused by an ad for College Inn canned chicken à la king that appeared in the Syracuse Herald on Tuesday, June 22, 1920 — three years before the company was supposed to exist. Popular hostesses are providing new and tasty delight for family and guests with College Inn Chicken a la King; Welsh Rarebit and Chop Suey. Any one of these remarkably delicious foods may now be served with all the piquant flavor that has made famous the renowned College Inn in Chicago's Hotel Sherman, all prepared under strictest supervision from recipes developed and guarded by world famous chefs. The remarkable part about College Inn Foods is that they are hotel prepared without being hotel priced. You will be delightfully surprised when you try them. Order several of these items today from your grocer. Yet another version brings the story back to the neighborhoods of New York City — specifically, a hotel in Brighton Beach, Brooklyn — where chef George Greenwald first dished it up for the hotel’s owners, Mr. and Mrs. E. Clarke King (in some versions of the story, especially online, their names are seen without the “E.”), in the 1890s. This was much more promising. For one thing, it eliminated the need for “Keene” to morph into “King.” Second, the time was about right, for reasons that will become clearer below. When Fannie Merritt Farmer published her The Boston Cooking-School Cook Book in 1896, she included two recipes for chicken à la king — signaling that the dish had become popular since Mrs. Lincoln's Boston Cook Book, on which Farmer’s book was based, was published, in 1883. Mrs. Lincoln had been silent on the subject of chicken à la king, perhaps because she’d never heard of it. The 1901 Settlement Cook Book also contains a recipe for the dish. A favorite dish served in one of the popular hotels of New York is Chicken a la King. The recipe is as follows [:] Cut into small pieces the white meat of a cold roast chicken. Make a sauce with two tablespoonfuls of butter in a saucepan over the fire. When the butter melts stir in two heaping tablespoonfuls of flour, which has been well sifted. When the flour and butter are mixed to a cream pour in slowly a pint of hot milk stirring constantly to keep from forming lumps. Allow the same to boil up once; then add a tablespoonful of grated onion, a saltspoonful of salt, and the yolks of two eggs. Stir them briskly through the sauce, add two truffles and two mushrooms cut in small pieces and fried lightly in butter, one sweet green pepper cut in shreds after the seeds have been removed, and a generous tablespoonful of caper chopped and just a suggestion of grated nutmeg. Last of all, add the chicken, stir all together and allow it to cook a minute. Chicken a la King is usually served in a chafing dish. 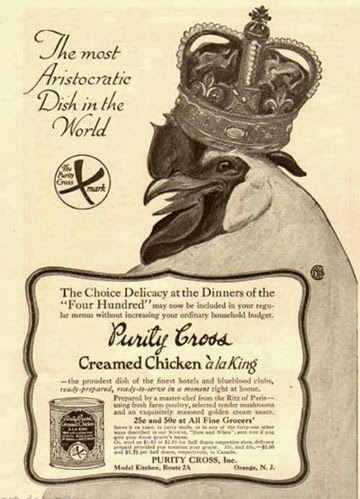 So... chicken à la king appears to have been created sometime between 1883 and 1886. For reasons that seem mysterious today, it suddenly became popular, and recipes for it appeared everywhere, springing up overnight, like French revolutionaries — or, at least, like mushrooms. Prepare and cut up the chickens the same as for plain fricassee…; Soak the pieces for half an hour, then drain and return them to the saucepan to moisten them with white broth…; Cook the chicken, drain it in a colander, and run the liquid through a napkin; put it back on the fire to reduce to half[,] adding eight gills of velouté sauce…, then reduce once more until the sauce adheres to the spoon, afterwards finish with egg yolks and butter. Strain through a tammy, and keep hot in a bain-marie. Wash thoroughly the pieces of cooked chicken in cold water; pare nicely, and place them in the sauce; after they are well heated, dress and garnish around with a cluster of carrot balls half an inch in diameter, blanched and cooked in white stock… and a little sugar, also small white onions cooked in white broth. Decorate the outside with small flat egg-plant croquettes containing mushrooms and truffles, and use also trussed crawfish for the ornamentation. Préparer la fricassee comme à l’Ordinaire.—Environ 10 minutes avant de servir, la garnir de: 15 petits oignons, cuit au Consommé blanc; 15 petits champignons canelés, cuits, bien blancs. Au dernier moment, lier la sauce avec 2 jaunes d’oeuf, 4 cuillerés de crème et 30 grammes de beurre; completer avec une pincée de persil et de ciboulette hachés. Dresser en timbale et entourer de petits fleurons en feuilletage, cuit à blanc. Make the fricassee in the usual way* …ten minutes before serving, garnish with 15 small onions, cooked in white stock, and 15 small fluted mushrooms, cooked but not browned. At the last moment, thicken the sauce with 4 egg yolks, 4 spoons of cream and 30 grams [an ounce] of butter; finish with a pinch of chopped parsley and chives. Form in a timbale [and then unmold onto a plate] and surround with small decorative pieces of puff pastry, baked but not browned. Sauté peppers and mushrooms in 2 Tbsp. butter, 5 minutes. Add flour and salt, cook until frothy. Put sauce in double-boiler, add chicken and let stand until hot. Melt remaining 1/4 Cup butter, beat in egg yolks, onion juice, lemon juice and paprika until thick. Stir egg mixture into sauce and chicken, add sherry. Serve on toast, garnished with pimento. In a large skillet, cook and stir mushrooms and green pepper in butter 5 minutes. Blend in flour, salt and pepper. Cook over low heat, stirring until mixture is bubbly. Remove from heat. Stir in cream, broth and reserved mushroom liquid. Heat to boiling, stirring constantly. Boil 1 minute. Stir in chicken and pimento; heat through. Serve hot in toast cups. Note: Toast cups are made by trimming the crusts from white bread, spreading with soft butter or margarine, then pressing, butter-side down, into muffin cups and baking at 375 degrees for 12 minutes or until lightly toasted. It seems that chicken à la king didn’t die a sudden and tragic death. Trillin would have noticed that. Instead, it suffered a slow diminution of quality, one or two ingredients at a time, one substitution after another — a sort of death of a thousand cuts — until there was no longer any reason for making the dish. Not long ago, on a particularly fancy airline menu, I came across an item called Poulet aux Champignons Supreme. I asked the stewardess what she thought it was. She looked around furtively. She drew closer. Then she said, almost in a whisper, "Chicken à la king." Recipes like chicken à la king do not spring into being from thin air, nor vanish entirely from the face of the earth. Instead they mutate, or assume new identities. They don’t need to hide in government silos in Kansas; they can lurk unseen among us, ready to reappear, unbidden, on a plastic tray, at any time. Betty Crocker Cookbook. New York: Golden Press (division of Western Publishing Company, Racine WI), 1969. Escoffier, Auguste. Guide Culinaire. London: William Heinemann Ltd., 1907. Stevens, Patricia Bunning. Unusual Origins of Popular Recipes. Athens: Ohio University Press, 1998. Trillin, Calvin. If You Can’t Say Something Nice. New York: Ticknor & Fields, 1987. Whitman, Joan (ed.). Craig Claiborne’s New York Times Food Encyclopedia. New York: New York Times Books, 1985.